Review Summary: I really don't enjoy studying glacial deposits. 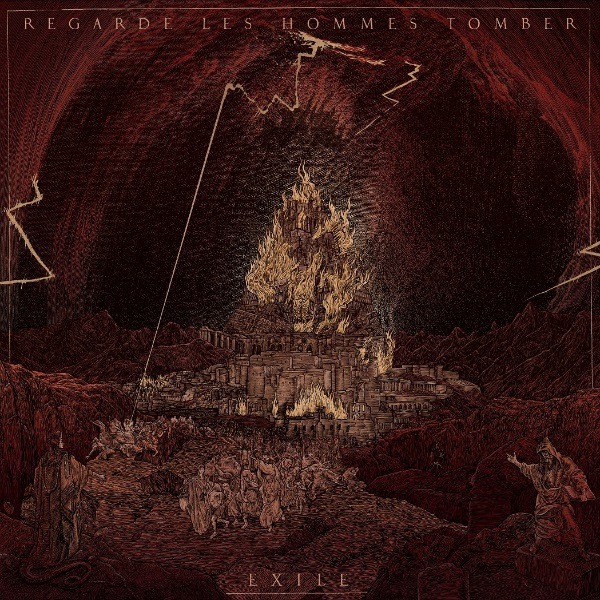 The second album from French act Regarde les Hommes Tomber, Exile, is as close to a perfect marriage of black metal and sludge metal as I've heard in years. That statement is not without weight. It's been a pretty popular genre combination over the past few years, and groups like Entropia (PL), Inter Arma, and Downfall of Gaia have released some undeniably fantastic music recently. However, never before has this style felt as incredibly seamless as it does on Exile. Blending different styles of metal in this manner often leads to somewhat scattershot, unconsolidated compositions in which a number of jarringly sharp transitions between different atmospheres and styles severely disrupt the flow of the song. To avoid the all-too-common analogies involving salads or blenders or any other kinds of food, think of it in geological terms. On one hand, you have poorly-sorted, unconsolidated sedimentary lithologies like those characteristic of glacial till. Clast sizes range from silt to boulders, roundness is all over the place, and the stuff is so crappy that you have to gather a sample in a bucket: in short, it's a steaming hot mess. On the other hand, certain extrusive igneous rocks manifest as beautifully homogenous blocks of solid dark rock. Looking at a section under a microscope or analyzing its geochemistry may reveal that it is the product of multiple bodies of magma mixing hundreds of kilometers beneath the surface, but the final product is a solid, cohesive thing that's far more than the sum of its parts. Also, you don't need a stupid bucket to sample it. Thus, Exile is the basalt to other bands' glacial till: you won't be needing any buckets here, folks. All that's required is a sledgehammer and some eye protection. Now, as forced and long-winded as that analogy may have been, I believe that it holds together**. The sophomore effort from Regarde les Hommes Tomber really is as seamless and consistent as the most homogeneous, boring basalt flow I've ever seen in its blend of black metal and sludge metal. The second track, 'A Sheep Among the Wolves," might be the best evidence of this there is. Furious, blast beat-heavy black metal transitions into a skull-crushing drop-tuned riff and then into a brooding atmospheric section and back, and not once does the song feel like it was haphazardly thrown together by inexperienced musicians. Rather, that song – and the rest of Exile – was crafted by a band whose ideas are indisputably matched by their songwriting abilities. Every influence shines through the album's notably fantastic production without overpowering the others. Are you a fan of the pitch black rage of Hexis" Have you ever marveled at the expansive song structures and atmospherics of early Altar of Plagues" Do the earth-shattering grooves of Thou get you going" Exile has all three – and more – in spades. The guitars are simultaneously buzzsaws and sledgehammers, the bass crunches and crushes, the drums wreck everything in their path, and the vocals are like a beautiful, unholy marriage of the wails of Gris and the impassioned shrieks of Altar of Plagues. It's one of the darkest, well-written, and most unrelenting things I've heard this year, and if you have any affection for any of the styles represented therein you owe it to yourself to give Exile a chance. @Asdfp I have a couple of times but it hasn't gone through. I just posted in the Meds thread about it, though, so hopefully it'll be fixed soon. Thanks, though! No worries >;] and good review, pos'd! also, album is out this year, not last"
Yeah, I know. I've tried editing that and the tracklist as well. The system does not like me. Hey, didn't know that. Thanks! Thanks for the review man, didn't know about this. I really like their debut. Keep 'em coming! Cmon man, this is blackened as hell but it ain't anthracite black.